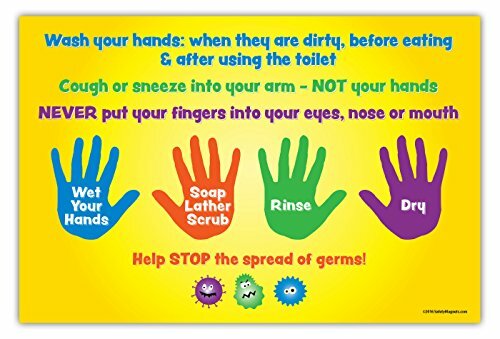 Hand Washing Instructions for Kids - Classroom Poster - Non-Laminated - 12 x 18 in. Don't forget to wash your hands! Hand washing is the best way to prevent the spread of the latest classroom bug. This kid-friendly poster includes hand washing instructions as well as how to cover your coughs and sneezes. Not only is this poster educational, it is also the perfect colorful decoration for an elementary classroom.... And maybe middle and high school too! Measures 12 x 18 inches. NON-laminated. Made in the USA. Manufactured using 100 pound cover gloss paper. Features easy-to-read, stylistic Sans-Serif font and crisp graphics. Discourage the spread of germs and keep your students healthy! If you have any questions about this product by Safety Magnets, contact us by completing and submitting the form below. If you are looking for a specif part number, please include it with your message. Fairy Tale Advice for Brave Kids Girl Posters, Set of FOUR 11'' 17'' Bedroom or Bathroom Decor. Motivational and Inspirational Quotes 4 Your Princess, Birthday Props. Daughter, Cousin or Sister.